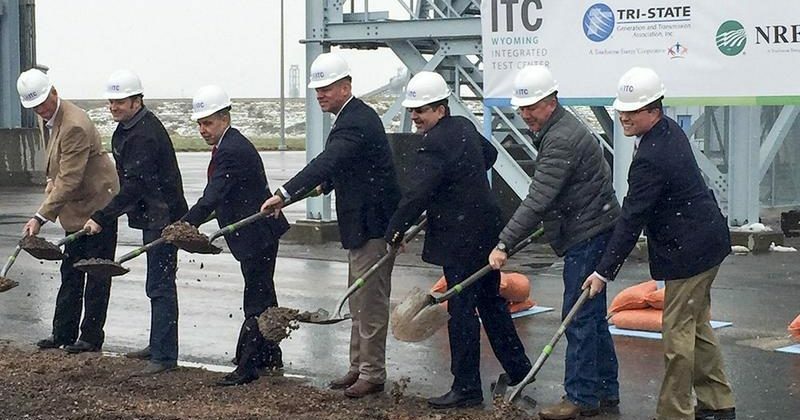 Construction formally began Wednesday on Wyoming’s Integrated Test Center, a $21 million facility for research on carbon capture, utilization, and sequestration technology. The facility, to be built at the Basin Electric Power Cooperative’s Dry Fork Station near the city of Gillette, is due for completion in summer 2017. The first research teams will be finalists in a current carbon use XPRIZE competition. This is the second such research site in the U.S. and one of only a small number globally, allowing for research and trials at a functioning coal-fired powered plant. It received $15 million in construction funding from the state, along with $5 million from the Tri-State Generation and Transmission Association and $1 million from the National Rural Electric Cooperation Association. Wyoming is the top coal-producing state in the U.S., providing 40 percent of national output in 2014, according to the Energy Information Administration. The industry in recent years has been squeezed by a number of factors, including low natural gas prices and an increasing global focus on curbing carbon emissions. “As I see the challenges coal faces now, I just can’t describe strongly how important it is for Wyoming to take this leadership role,” Mead said.